After the concrete properly dries, it's time to unveil the artwork and see what color the concrete has really become. How to Neutralize the Stain and Rinsing off the Residue. A residue will usually form during the drying stage. 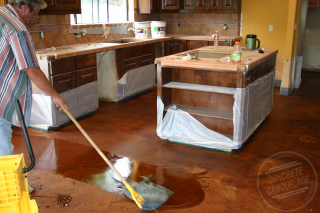 Some acid stain colors will have a heavier residue while others will have hardly any. Regardless though, the acid stain residue must be neutralized and rinsed off with clean water. You can use mops, water hoses, wet/dry vacs, and/or extremely soft bristle brooms to neutralize the stain and remove the residue. Neutralize with water and either baking soda, t.s.p., or ammonia and then final rinse twice with clean water only. We recommend using 12 to 16 ounces of ammonia per mop bucket. Or 6 to 8 ounces of ammonia to 1 gal sprayer of water. When cleaning the stain residue, a very soft bristled push broom, similar in softness to the brush at a car wash, can be used to lightly brush the area and help remove the residue easier. When you rinse the residue it is important not to over scrub. The stain can be scrubbed down fairly easily at this point. Once it has been washed and allowed to dry, the stain will lock in and not scrub down. So if you want to scrub it down to try and lighten some areas, do it when you first wash the residue. Actually, the removal of absolutely all the residue isn't the real objective and complete removal of all the residue isn't necessary. Though you do need to remove as much as you can. A very light powdery residue remaining should be OK but a lot of residue is not. The reason for washing the residue is to neutralize the acid. So long as you properly neutralize and rinse the concrete well a couple of times, it should be fine. Note: If you do not properly neutralize the stain, then the sealer will lose it's bond, which will then have to be stripped and re-applied. If you leave too much residue you could have streaking or discoloration. So again, while you don't have to get every last bit of residue up, you do need to neutralize and rinse very well. You can use a pump up sprayer to spray the neutralizing solution onto the concrete, and then mop up with clean rinse water, or if outside use a water hose to flood rinse the concrete while lightly brushing. Be sure to rinse a couple of times. What the concrete looks like while it is still saturated wet from washing the residue is what it would look like if you apply another coat of stain, or if sealed with a Solvent Base Sealer. What the concrete looks like when it is drying down, and to the point of being damp, (not saturated wet but not completely dry either, rather in between - damp) is what it will look like if sealed with Clear Shield Water Base Decorative Concrete Sealers. The residue will still have the capacity to stain and kill vegetation. So choose ahead of time where you'll be emptying your mop buckets. When staining outdoors, it's important to flood rinse. Keep the water flowing to dilute the residue as much as possible as it is washed off the concrete. If washing residue across unstained concrete, then it's even more important to flood rinse and also to use a brush or push broom to push it and brush it to prevent it from staining. When mopping the residue, change the water regularly. 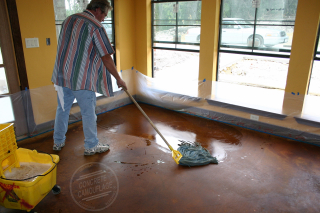 When doing more than one coat of concrete stain, there is no need to remove the residue between coats. Just be sure the first coat is dry. Walking on wet concrete stain will leave footprints. If you prefer it to be darker, once you have rinsed the residue, then you can do additional coats of stain.